When it comes to knitting, I am really clueless. I don't get how it works. I don't have that sort of intrinsic understanding of the process that I suspect the true knitter requires. I can follow a pattern and I can get by with the basics. 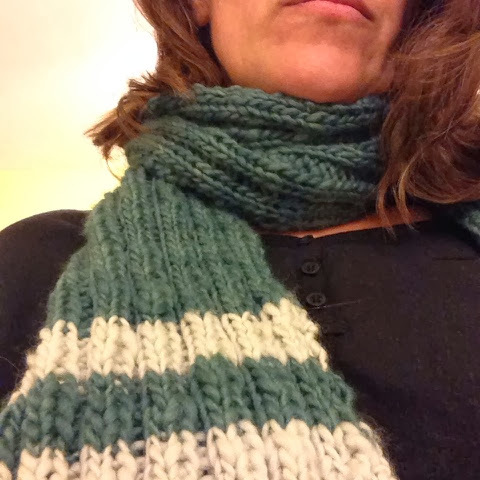 When I first knit something on circular needles I thought it might be the start of a whole new things for me. 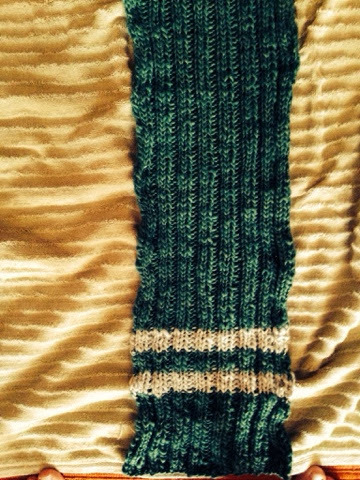 A thing in which I got knitting. But no, I've just stagnated. I read quite a lot of knitting blogs and I have watched more than one youtube video but I still don't understand how it works. I can't correct a mistake very well, I am pretty hopeless at picking up stitches because I struggle to work out what the hell the yarn is doing. I cannot understand how people can write knitting patterns. I cannot understand how people can alter knitting patterns. Without a picture of what a pattern looks like I would have absolutely no clue at all. And instructions in patterns are quite often confusing to me because I don't really know where I am heading. Is it simply time and practice? Will it one day click? Or is it a brain wiring thing? 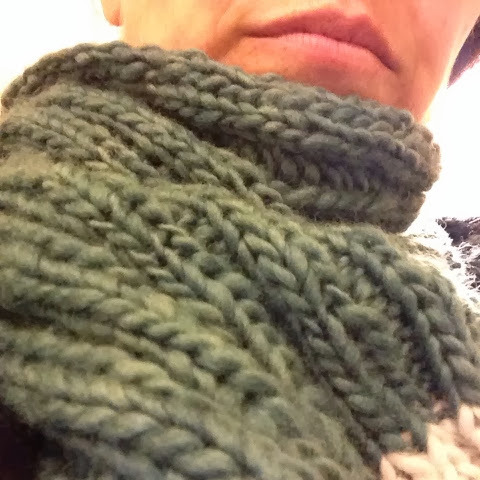 I really love knitting and I really wanted to finish this scarf, the first thing I have ever knit for myself (nb. Craig queries whether it should be 'the first thing I have ever knitted for myself. I feel that knit can happily work as past tense but I am open to adjudication from grammar enthusiasts). In fact I so wanted to get it finished (partly because I actually need it - I managed to leave my scarf in Santa Monica and it's bloody cold here) that I stayed up late to get it done, which involved watching 6 out of order episodes of 'Will and Grace'. Initially Grace was pregnant, and Will was in love with a cop. Then Grace wasn't pregnant and Will was in love with a Canadian photographer. Then Grace married the Canadian photographer so that he could stay in the US. Then Will had broken up with the cop but Grace wasn't pregnant so I think that this before the photographer. I could have changed the station, but honestly, we have about fifty billion channels to choose from and I can almost never find anything to watch. Anyway, I stayed up late and finished it - it is a completely plain rib knit in a lovely wool by Manos called Spruce. I had planned stripes but then decided against them, so ended up with just two, which I think look a bit crap and I probably should have left them out altogether. But anyway, I finished it and then I thought - should I block it? I've read about blocking but I don't know whether it's required for every knit, whether it would be required for this knit, or really how to do it at all. I only have a few pins here, not having brought any sewing kit with me. The pins come from a shirt that Craig bought which was pinned in no less than 12 places (!). So I damped down the scarf and pinned it with pins and, when they ran out, needles, to a couple of towels. Is this appropriate? By the next morning it had mostly dried and was definitely wider and more open than before. I whacked it, still pinned to the towel, onto the hydronic heater (a gentle heat but still - appropriate? Or wildly inappropriate?) and now I've worn it and it is lovely and soft and I like the colour (sans stripes) a lot. But I remain clueless. That kind of blocking is fine! Blocking is basically to even out the lumpy bumpy bits and make things sit smoothly. It's Bsolutely essential for lace knits, less so for plain knits, but it does always improve the sit of an item. Gentle heat entirely appropriate. For me, knitting entered a while new realm when instarted knitting lace items (shawls etc) and learnt to knit from a chart rather than written out instructions. With a chart,meach kind of stitch is represented by a different symbol, and the symbols do resemble the stitches so charts actually helped me to learn to 'read' my knitting and understand what is going on. Before that i just followed written instructions blindly and hoped for the best. Start with a simple chart to get a feel for it. And for what it's worth, i like those white stripes. The yarn looks delicious too. Squishy and soft. Suse that is encouraging because you are one of the people I thought if as having a naturally knitting wired brain, you've made your own patterns for goodness sake! What you say makes sense.